Your choice of leather or nylon, these tabs come with solid brass snaps and are a great tool to help with your dog's off leash training. 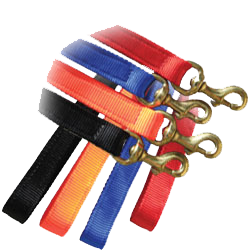 Best Nylon Leash- 6' x 1"
Hand-stitched, stong, and very durable. Double layer nylon. Brass bolt snap. 6' x 1". Available in black, red, blue and orange. Best Nylon Leash- 5' x 1"
Hand-stitched, stong, and very durable. Double layer nylon. Brass bolt snap. 5' x 1". Available in black, red, blue and orange.